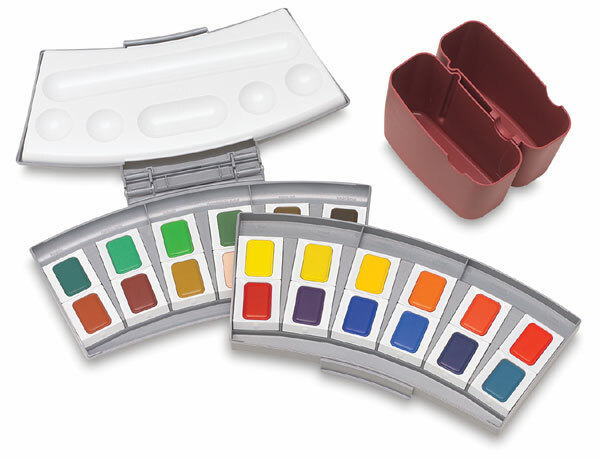 These watercolors from Germany are made from high quality pigments of the finest grain size. Easily soluble, they deliver good lightfastness with brilliant, dense colors. Conforms to DIN 5023. Opaque and Transparent Color Sets. This set is contained in a plastic palette box and features brush wiping edges and an interior palette section. The colors included are Lamp Black, Paynes Gray, Carmine Red, Flesh, Indian Red, Real Red, Vermilion, Real Yellow, Orange, Lemon, Indian Yellow, Yellow Ochre, Cobalt Blue, Violet, Prussian Blue, Ultramarine, Turquoise Blue, Blue Green, French Green, Yellow Green, Chromium Oxide Green, Burnt Sienna, Umber Natural, and Van Dyke Brown. ® Pelikan is a registered trademark.